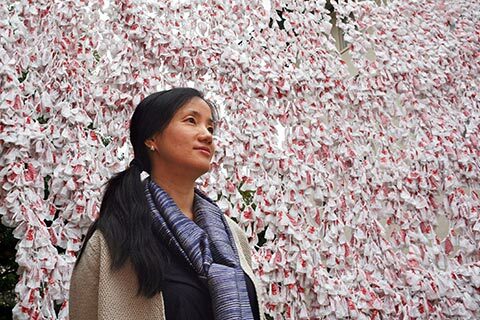 Society’s love-hate relationship with plastic bags is explored in “Plastic Poetry,” an architectural installation designed by a team of Texas A&M students led by Weiling He, associate professor of architecture, one of the four designs chosen from a worldwide call for proposals and installed last October at the University of Texas. Next fall, when students begin taking classes in a renovated Francis Hall, the new campus home for the Department of Construction Science, they’ll be able to see exposed mechanical, electrical and plumbing systems at work in a $100,000 specialty lab funded by Dynamic Systems, Inc.
A “bid room” outfitted with state-of-the-art video conferencing equipment will be built in Francis Hall, the future campus home of the Department of Construction Science, with the help of a donation from Clark Construction Group LLC. 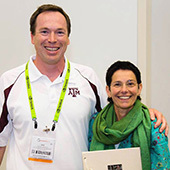 Texas A&M planning professors are researching how urban design can aid fitness. 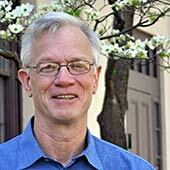 Philip Berke ‘81, widely regarded as one of the nation’s top land use planning scholars, is returning to Texas A&M in 2014 to rejoin the urban planning faculty and help lead the university’s Institute for Sustainable Coastal Communities. 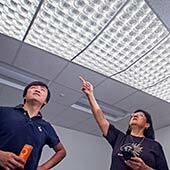 An innovative, energy saving lighting system that can pipe healthy, full-spectrum daylight more than 40 feet into a building and potentially raise worker productivity is being tested at the Texas A&M College of Architecture’s Daylighting Laboratory. 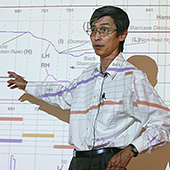 Francis Quek, who joined the Department of Visualization as part of an initiative by The Texas A&M System to attract top-notch faculty, will heighten the department’s involvement regarding the interaction between people and technology. Whether developing parkland, revitalizing a moribund town center, or creating a municipal master plan, for more than 25 years small communities have turned to the college's landscape architecture and urban planning students and faculty for help. 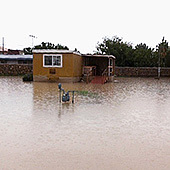 The Texas A&M Colonias Program came to the aid of flood-stricken West Texans last September when heavy rain and rising water drove many colonia residents in Socorro, a suburb of El Paso, from their homes. 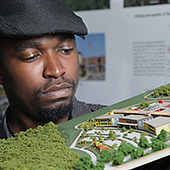 Tasked with creating museum-quality models of two Brazos Valley African-American high schools that burned down in the 1960s, a group of Texas A&M graduate architecture students relied on recollections from the high schools' former students. Graduate architecture students from Texas A&M unveiled design concepts for a 75,000-square-foot ambulatory health care facility for children to be constructed in New Jersey as part of an interstate pediatric health system. 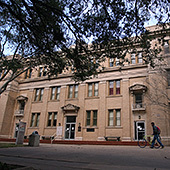 Design programs at Texas A&M rank among the best in the United States. 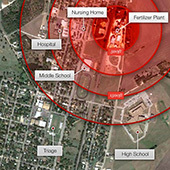 College design programs ranked among best in U.S.
Texas A&M’s landscape architecture programs and the graduate architecture program were once again ranked among the best in the United States in an annual survey of professional practice leaders who have hired and supervised recent design graduates. 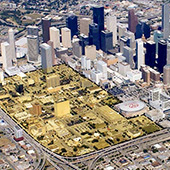 The underutilized southeastern area of downtown Houston could see its property values rise with new green space and a signature landmark, concluded Master of Land and Property Development students in an analysis published last spring by the Urban Land Institute’s Houston Council. 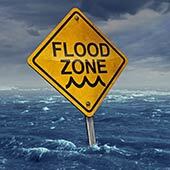 A comprehensive plan for Gonzales by graduate planning students earned an award. A comprehensive plan to guide municipal policymakers in Gonzales, Texas, prepared by graduate urban planning students at Texas A&M, was recognized with the Student Project Award by the Texas Chapter of the Texas American Planning Association at its October 2-5 conference in Galveston. 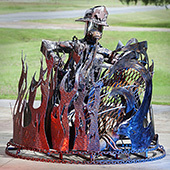 An intricate metal sculpture of a fireman bursting through a wall of flames and water, created by a team at the Automated Fabrication and Design Lab, won an award in a fundraising competition benefiting Bryan's historic Queen Theater. 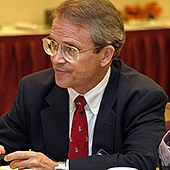 Jeff Haberl, professor of architecture, was elevated to fellowship in an international society dedicated to improving the built environment. A series of large-scale paintings by Felice House, assistant professor of visualization at Texas A&M, invites viewers to question gender stereotypes in American western mythology in “Re•Western,” an exhibit at G Gallery in Houston December 7-29. 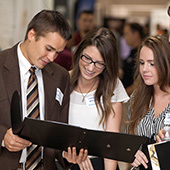 Companies looking to hire construction science students at Texas A&M turned out in record numbers at fall 2013 career fairs hosted by the Department of Construction Science. 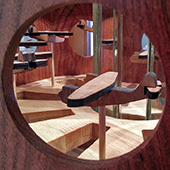 Visitors interacted with art created by students at Texas A&M’s Department of Visualization in “PLAY inside the box,” an October exhibit at the Art Center of Brazos Valley. 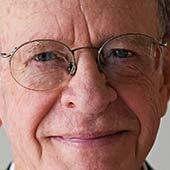 A distinguished career in architecture, support of emerging professionals and service to the community has netted Reagan George ’59 the Texas Society of Architects’ 2013 Medal for Lifetime Achievement in Honor of Llewelllyn W. Pitts, FAIA. 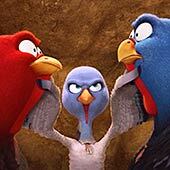 Turkeys time travel to the first Thanksgiving in an effort to prevent their brethren from becoming the day’s main menu item in “Free Birds,” an animated movie that includes 12 former visualization students in leading animating roles. 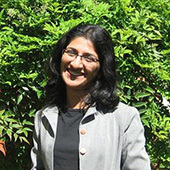 directs research at HKS Inc.
Research findings create the ingredients for design, allowing architects to create amazing environments based on the best possible information and insight, said Upali Nanda, HKS Inc.’s new director for research, who earned a Ph.D. in architecture in 2005. 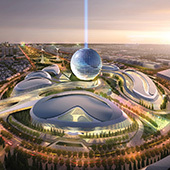 Expo City, the focal point of Expo 2017 in Astana, Kazakhstan, a world’s fair showcasing the latest developments in renewable energy, will be built from a design by a firm co-founded by Adrian Smith, an outstanding alumnus of the College of Architecture. 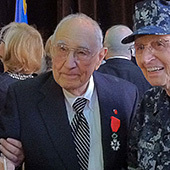 Outstanding College of Architecture Alumnus and World War II veteran William Peña ’42 received France’s highest honor, the medal of Chevalier of the National Order of the Legion of Honour, during a 2013 Veterans Day ceremony in Houston. 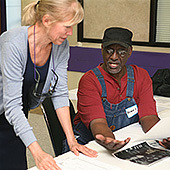 Nancy Jeanne Volkman, associate professor in the Department of Landscape Architecture and Urban Planning at Texas A&M University, passed away Tuesday, Sept. 10, 2013 after a long illness.